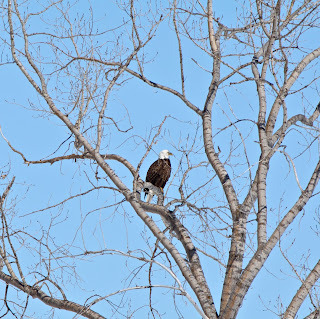 My sister, the kids and I were driving home from the farm on Sunday afternoon when sister Kirsti spotted a bald eagle in the ditch feeding on a carcass. I turned around to go back to see it, quickly grabbing for my camera. A majority of these pictures were taken by my sister with the car window down to capture the moments with the bald eagles. There were actually two bald eagles and they were feeding on deer that have not survived the winter. At our friends the Wagner’s farm, 500 deer have wintered in their hay, ruining it and scores have also died in it. It’s a common sight on the prairie right now. We need more of you to come and safely hunt in the fall to fill our deer license tags so this doesn’t happen in such large numbers. 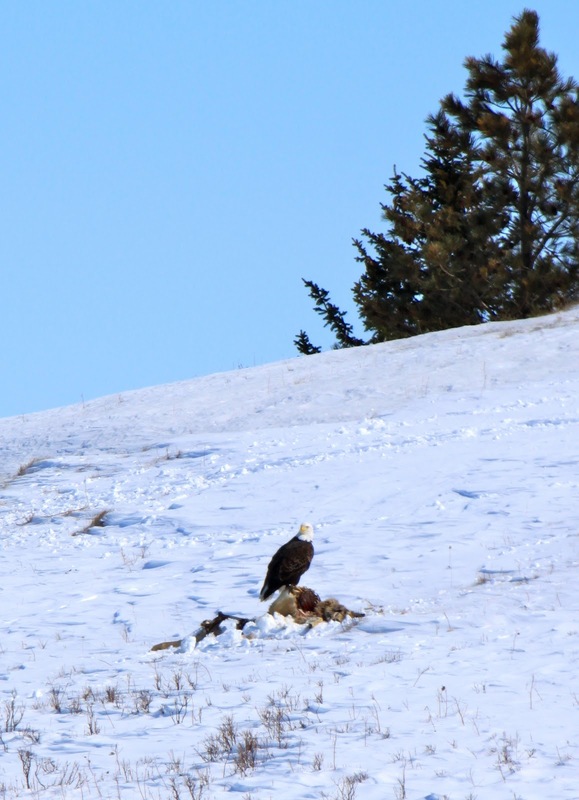 My Ornothology-loving husband (the study of birds…I fully admit I did not know that term until I married him) told me bald eagles are not scavengers and that it was very rare to see them eating a dead animal like we did. But it clearly means the bald eagles are hungry in the winter that seems to never end on the prairie. Regardless of the season or their feeding, the bald eagle’s majestic beauty captivated my sister and me. Miss A slept through it. Miss E wanted the window rolled up as she was cold and our teenager thought we had seen enough bald eagles for the day. We continued our prairie drive, pointing out to the teenager that one advantage of a North Dakota Sunday drive is that you get to see beauty, even amidst March Spring snow, in wild life. This drive’s highlight particularly was the spectacular pair of bald eagles snacking on a Sunday afternoon. What’s your favorite bird? I know there is a little Ornothology love in each of you. Wow, breathtaking. I’ve saw one on the side of the road once in Illinois. I nearly wrecked my car I was so surprised. My favorite would have to be a red winged blackbird. I have plenty of male relatives who’d love to hunt up there. Well…maybe not in that much snow. THANK you for sharing these! I’ve never seen a bald eagle in person and am jealous. I’m sorry about the deer starving to death. How terrible. Oh my gosh! That is SO neat that you can see bald eagles right from your place! I have only seen one once in my life so far and that’s when I was house-boating on lake Shasta and one flew over head early in the morning. we loved watching eagles in our front yard this winter…they would land on the half frozen river and look for fish…so very cool!! Good thing is i have seen a couple of posts on eagles and they just get prettier every time! Great pictures. Such a beauty of nature. Circle of life right there in front of you. Great shots of the beautiful baldy! We’ve been keeping an eye out for them here, but so far no luck. They usually are on the heels of the geese passing through! Glad you found our blog, always fun to find fellow bloggers from the sticks Ha Ha! 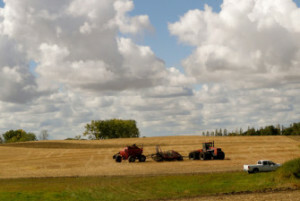 Your profile sounds so interesting, love how you gave up the city life for rural living (good choice in my opinion). Nice Blog, I’ll be following! !